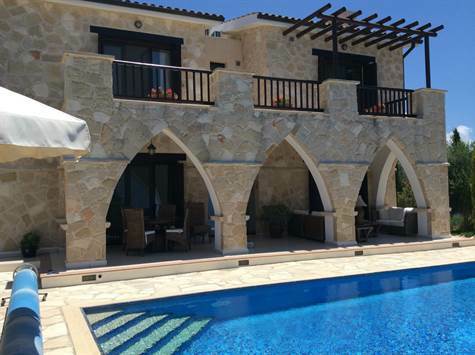 Ineia, Paphos – This custom built luxury home with full title deeds is situated in the quaint traditional village of Ineia on the edge of the Akamas peninsula and benefits from amazing sea and mountain views. The property is in immaculate condition and built to a high standard with top quality finishes throughout. There are many character features and a variety of quality materials have been used including stone, marble and granite to create this impressive home. Designed as a permanent residence by the current owners, it has many extras including underfloor heating, infinity heated swimming pool, double garage with electrically operated door, purpose built BBQ and bar area, UPVC double glazed windows, air conditioning and much more. The ground floor accommodation is spacious and features a comfortable lounge with feature fireplace, central dining area, well equipped kitchen with breakfast bar, utility room and guest toilet. On the first floor are three double size bedrooms, all with fitted wardrobes, en-suite facilities and easy balcony access with plenty of space to enjoy the amazing sea and rural views. An impressive covered veranda overlooking the infinity swimming pool and the coastal views beyond provides a wonderful shaded area for relaxing and outdoor dining. The outside space is totally private and includes a well stock orchard. Accessed directly from the road or via a gate from the beautifully landscaped gardens is an additional plot of 669 sqm with a 30% build density. Here there is potential to construct a guest house or maids accommodation/office if required. In summary, this is a truly stunning home which is well designed, constructed to a high standard and lovingly cared for, in a fabulously peaceful and private rural setting.